I am not going to lie, I had no idea how to title this post. So I went with the obvious, as I am writing this post over the weekend. So yeah. I have two things to talk about. First of all this post. This post is number 200. 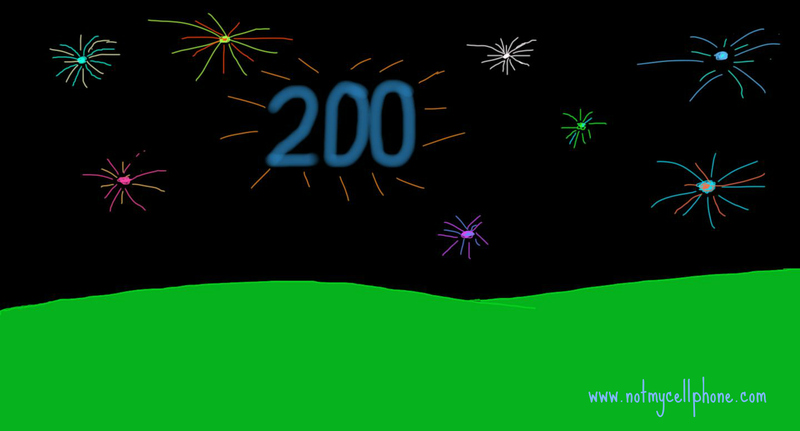 My 200th blog post. How the heck did I manage to pull that off? Easy. You guys. The inspiration, the support, sometimes the suggestions on grammar and paragraph spacing. You my friends and readers are the reason how I have made it to 200 posts. Thank you . To celebrate I called Macy’s and asked for some fireworks in my blogs honor. They told me they would set one off next fourth of July for my blog. However, I could not wait that long and what if I took a picture of the wrong firework? That would be horrible!!!! So here’s the next best thing. Thank you for reading me. I appreciate it. You guys are all awesome. Now the second part of this post. This was originally what I have been thinking about since Friday, when the information crossed my twitter and Facebook account. JDRF is running a mobile challenge called Be T1D for a Day. Mind you some sarcasm and poor humor choices may pop up during the rest of this conversation. Mind you I am not trying to be jerky about things. That is not the case. Nor am I trying to be sarcastic, too much. The idea of trying to get people to see the emotional toil that people with type 1 face on a daily basis. The choices, the decisions, the battles we face, is amazing. I would not want to be the one who gets the complete poop dumped on them with 24 texts of work. I mean for people to realize that we make some conscious and unconscious decisions. Why sometimes we can eat the huge pumpkin pie (pie…. )and other times why we run away screaming from the exact same thing. It can be confusing. Not to mention why people sometimes really don’t get it and why the stupidy stereotypes happen. If people saw the real struggles we face, the serious injustice in the cards we have been dealt maybe they might be bigger advocates of some of the programs out there. Maybe they might see why we need a cure. Why insulin is only a small part of the big picture. I mean to some people it is referred to as insulin therapy, not an insulin cure. Obviously, if this is just a therapy, it is not a cure. Alright, let me seriously try to get off this soap box. I didn’t mean to do that. Where did that come from? Anywho, I give serious props to the JDRF for what they are trying to bring about. Just a small insight into the lives of those people living with type 1 diabetes truly face. Maybe some people will GET it. Maybe some people will continue to be just as ignorant. “You know Brian, I tried that text thing from the JDRF, I only got like 6 texts and there was nothing to concerning for me. I don’t see why you think this is such a burden.” Those people will never get it. However, maybe others will. Thank you JDRF for your continued advocacy for us, your continued ideas and support, and most especially your continued search for that elusive “five year” cure. You guys rock. Great post Brian! It’s true, there’s a lot more to T1D than just going through the motions. Even if JDRF gave these folks a stack of syringes, a vial of saline, and a BG meter, they still couldn’t experience even half the “life” we go through. I respect JDRF and everything they do, but I can’t help but wonder if the person who came up with this program is a PWD or not, and if they aren’t- if the PWDs in the organization argued that the program trivializes what living with and taking control of diabetes is all about. I haven’t yet decided if I will ask friends or family to participate, if I think it will really help them understand. But I suppose it’s a start, and the intentions are good. I am torn on this myself. Obviously. I mean this could just be the beginning, the next time they do it could be more intense. I like it, but I don’t really think it is enough. yet. I love your post!!! I was initially excited about the JDRF T1Dforaday program, but now i’m feeling a bit skeptical. You might call it sarcasm, I call it reality! 7:55am – bgnow 8.6/155 before drive to work – to correct or not to correct, that is the question? Even as a fellow person with T1D i’d be interested to get the play by play on someone else’s day. Lol, let’s see if anyone else has any interest. I would be a little worried about giving me that much control… Muahahaha. I also can’t decide if I want to get my family involved in the T1D for a Day project. Can I submit their phone numbers without them knowing?! There is a small part of me that wants to do that as well… How evil would that be? But I do wonder does it start Midnight of or like from 7:00 am to 7:00 am? First of all, congrats on 200 posts! Secondly, I love the way you moved through this issue… There is something to appreciate on JDRF’s part. They are trying… Maybe a texting app with around 200 texts/day may be more effective? haha. In addition to the things that the app can’t convey are those moments in life when something reminds you of diabetes that is completely unrelated. Like a shoe…You look at that platform studded heel, and think “oh that would be great on someone else, who doesn’t have diabetes and have to worry about the well being of their feet” Can there be a text for that? Here’s my feeling of underlying reality… we create blogs, those of us with the big D, because we know that even a SPOUSE or brother or sister -who lives with is and is around us 24/7 while we live with diabetes- will not be able to 100% understand how much energy it takes to manage the disease. And to everyone else… it’s invisible. people cannot see it. it must not be hard. right? we create blogs to help them understand, and to connect with each other. the DOC is the app… it just takes too much time to get to know if you are an outsider and you aren’t being paid for it. So, I salute you… for 200+ days of writing and for being there, showing some one what it is like to live with type-1. Congrats on 200! That’s awesome!